Holy F! They are also the fast sharks! Has anyone done any fishing this year? I went back to Newfoundland and caught a 10 lb salmon. I wouldn't be leaning over the gunwhale to get a closer look! They are officially on notice. Post pics! Here’s one from last year. That’s not me, that’s the guide. Nice fish. Good luck! And post pics. I knew someone who was a marshal on the BASS tourney recently here. He said the craziest part is how fast the fisherman drive to get to their spot, super fast and he and the ESPN camera guy was thrown around a bit holding on for dear life and utilitarian boat so no cushions etc.. And the conditions went from hot (in Texas and no shade to good rain one day) but they still caught fish in all conditions. And are quick to move and try something new if it aint working. has anyone used this brand of bait before. I have bought this brand of bait at bass pro in rocklin ca. Nope. I'm sched to go out on July 17th. some Bubba's fm work are talking up the canned corn for bait. I'm taking my Mossberg 590 and some light bird shot. That leaves the head and tail intact.....for mounting. Tying flies for my Newfoundland trip next week. Hey Whoozit, got any spares for trout? 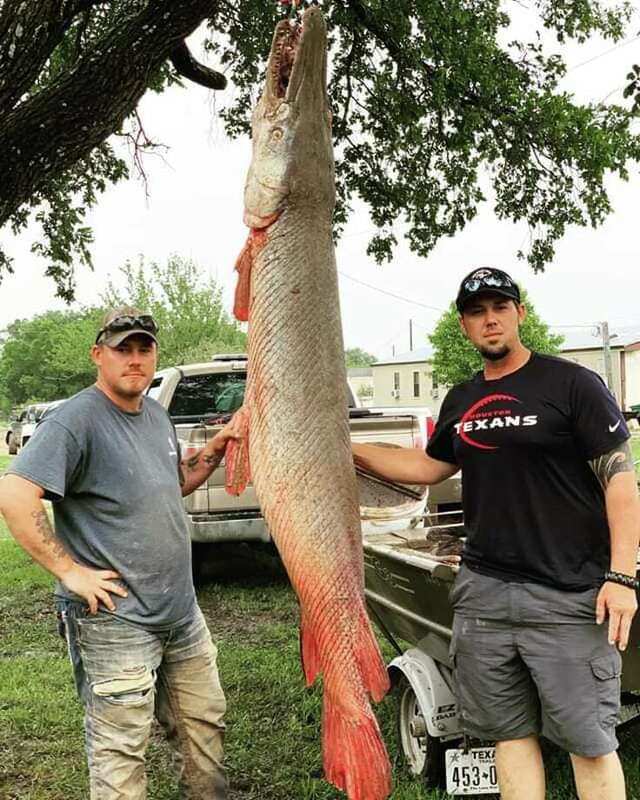 Big Alligator Gar caught on the Brazos by line not by bowfishing.